Gerardus Mercator was a renowned 16th Century Flemish cartographer and map maker – born in Ruplemonde, Flanders in the year 1512. He was a leader in marine navigation, and sought to provide maps and directional aids to make the job of the travellers of his day (primarily sailing boat explorers and traders) easier. He became the world’s leading globe maker and was a pioneer in creating a flat two-dimensional representation, on a single page map, of the entire global spherical world and all the shipping lanes worldwide. Mercator was the first person to group related maps together and label them with the word Atlas. Indeed, the iconic, ‘orange-peel’ sectioned, time-zone Mercator world map – to this day – still normally forms the first map in the early pages of most school and children’s atlases. In simple terms Gerardus Mercator made bespoke long-haul travel easier, and removed on behalf of his clientele a lot of the hard work involved in globe-trotting. Mercator Enterprises, through its Revealed Travel brand, is proud to assume his mantle, and through the provision of the travel services we sell we aspire to provide a modern-day version of his aims. 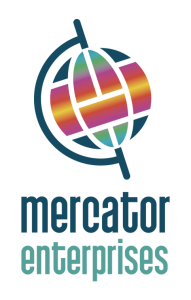 Thus, in sharing the same end-game, values and traditions as Gerardus Mercator, we have adopted his name as our company name, and a version of his globe as our logo.